Compounding Docs is wholly-owned by clinical pharmacists with Doctor of Pharmacy (PharmD) degrees who have extensive training in compounding and consultation. Our clinical pharmacists have built a pharmacy specializing in compounding medications in the Boca Raton area. They have a membership with Professional Compounding Centers of America (PCCA), a national organization with over 3,000 pharmacies which provide 24 hour clinical information as well as continuing education for physicians, nurse practitioners, and nurses. Our PharmDs also have consultant pharmacist licenses with over 50 years of combined experience in drug regimen review and patient consultation. Chuck is an owner and chief compounder of Compounding Docs Pharmacy. He was raised in Portsmouth, Virginia and attended Norcom High school where he was captain of the golf team. Chuck received his B.S. in Biology at Virginia Tech. From there he moved to South Florida and completed his B.S. in Pharmacy from Nova Southeastern University in Fort Lauderdale, FL., and then completed his PharmD degree from the University of Florida. Chuck spent the first years of his practice in Hospital and Psychiatric pharmacy. The following 12 years were spent as a clinical specialist in geriatrics. 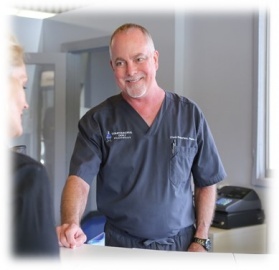 In 2003, he left to pursue his dream of owning his own pharmacy and with his partner, Dr. Martha Little, opened Compounding Docs Pharmacy in Boca Raton, Florida. He is a member of PCCA, IACP and A4M and has specialty training in Hormone Therapy, Dermatology and Sterile Compounding. He also coordinates and oversees clinical clerkships of pharmacy students from around the country. Chuck has been named Professional Compounding Centers of America’s (PCCA) Pharmacist of the Month and served on PCCA’s Advisory Council from 2014-2015. Chuck lives in Boca Raton with his wife and two sons. His hobbies include cooking and golf. Martha is an owner of Compounding Docs Pharmacy. She graduated from the University of Florida in 1984 and received her Doctor of Pharmacy from Nova Southeastern University in 1995. 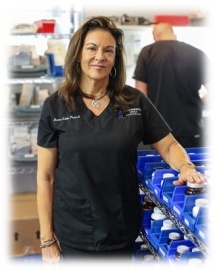 In 2015, Martha left her Director of Quality Improvement position with Omnicare of South Florida, to focus her experience on growing Compounding Docs Pharmacy. At Omnicare she was responsible for risk management, contract negotiation, and pricing, implementations of new accounts, financials, and key account management. Previously, she worked for private and public LTC Pharmacies in operations, consulting, quality improvement, sales/marketing, and executive management for 20 years. Martha utilizes her consulting skills which incorporate her 25 years of experience in management for a variety of pharmacy settings with the goal of improving the quality of life for those her pharmacy serves. Martha is married and has a son in college. Her interests include running, golf, and travel. Let us know how you enjoyed your pharmacy experience here at Compounding Docs.